Saudi Arabia has, through its Ambassador to the UN Abdallah al-Mouallimi, addressed a letter to the UN Security Council complaining about Iran’s action in the Yemeni war. Riyadh accuses Tehran of supplying the Houthi Movement and its allies with weapons and missiles that have been fired into Saudi Arabia killing hundreds of civilians and damaging infrastructures such as schools and hospitals in the border regions of Najran, Jazan and Assir. It pointed out the use of “ballistic missile of the type ZilZal-3 (Earthquake-3)” on the city of Najran on 31 August which it claimed was “a short range ballistic missile produced in Iran.” The total number of ballistic missiles fired into Saudi Arabian territory recently nears 30 according to the complaint. Tehran is yet to react to the alleged role it is playing in fueling the Yemeni war as the Saudi Ambassador claims that several Iranian weapons have been intercepted on their way to the Houthi rebels by Australian, American and French naval forces with most of the crew members on board being Iranians. Iranian-made Anti-tank missiles, thousands of rifles and Dragonov sniper weapons, AK-47 rifles, mortar pipes, missile shells, and RPG launchers were some of the weapons seized. The war in Yemen has been deemed as a proxy war between Saudi Arabia and Iran as both countries seek regional supremacy. Their sectarian divide has intensified the battle. 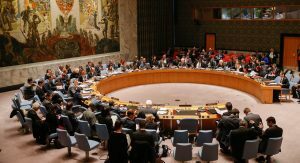 Riyadh wants the UN Security Council to stop weapons smuggling from Iran to the rebels as it warned that it could take necessary measures to secure its border and protect its citizens. Saudi Arabia is heading the military coalition fighting in Yemen to reinstate President Hadi as the legitimate president of the country. Almost 18 months since the campaign began, the Houthis are still in control of Sana’a and most of the northern part of the country. Written by: Peter Mulvany on September 16, 2016. Posted by Peter Mulvany on Sep 16 2016. Filed under Gulf News, Headlines. You can follow any responses to this entry through the RSS 2.0. Both comments and pings are currently closed.